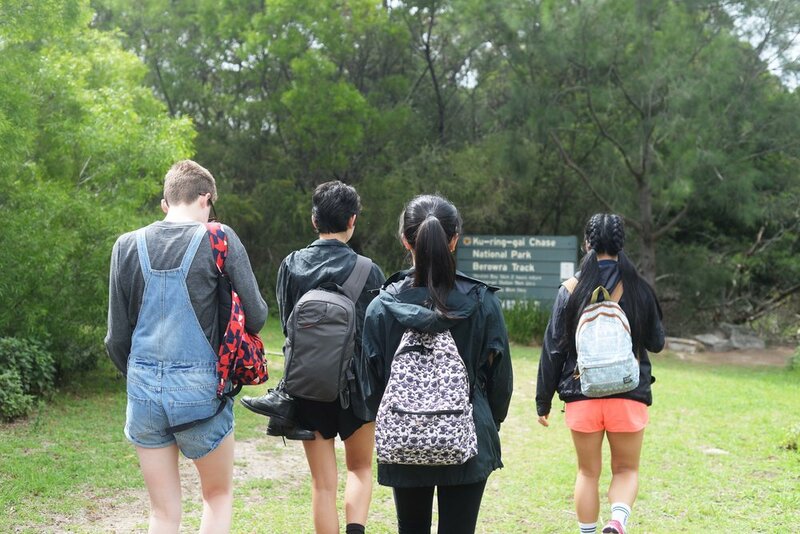 Last weekend a few friends and I decided to check out the Berowra to Mt Kuringgai hike in Sydney's Kuringgai Chase National Park. Having lived nearby for many years, it's a surprise I haven't done this walk before. It's very accessible - starting at Berowra train station and finishing at Mt Kuringgai station. We set off early on Sunday morning, ready to tackle the 10km ahead of us before the Summer heat became overwhelming. Even though the national park is not too far from the Sydney CBD, it felt like we had escaped civilisation and landed in this charming, green wonderland. I brought along my new Sony FDR X3000 action camera for some filming fun. I've only had it for a few weeks but it's been fantastic so far! The optical image stabilisation is great, and it's so much lighter than my massive DSLR. Stay tuned for a short video coming your way soon. Just keep walking, just keep walking, just keep walking, walking, walking... I think we all overestimated our fitness levels a bit - we were absolutely exhausted by the end of the 10kms. If you're thinking of attempting this walk, do keep in mind the incline/decline. It's a beautiful walk nonetheless so I would encourage you to give it a go if you were considering it!